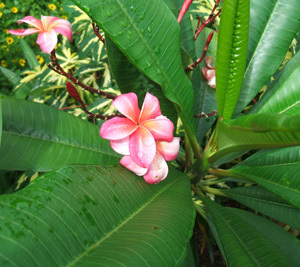 Frangipani (Plumeria)is also known as Pagoda Tree and Temple Tree. This flower is well known in Hawaii where visitors are often greeted with a lei or necklace made from the beautiful, fragrant long lasting blooms strung together. The colors are in variations of white, pink, red and yellow. This plant does not like to be in wet soil. Once established, it's drought tolerant. Propagation can be easily made from limb cuttings that root easily after hardening off. Seeds can also be sewn after drying on the tree. In tropical frost free areas the tree can grow from eight to 40 feet high. I once saw one at my hotel on the beach in Tanzania that was around 25 feet high. Where I live in central Florida they tend to be much smaller because they are not frost hardy. It's always best to take a few cuttings long before a frost, just in case, or move the entire plant inside.